Kronos was the host of the St. Louis, Missouri show Zone 2, which ran on KTVI-TV Channel 2 from 1965 to 1966. 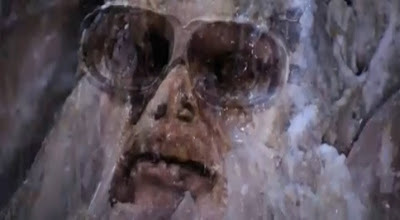 Jack Murdock, who played Kronos, passed away on April 27, 2001. 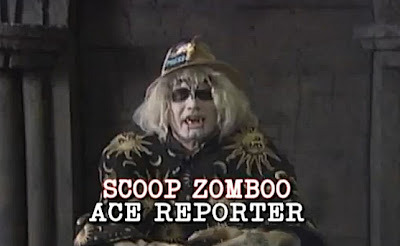 In episodes 7, 8, and 9 of Zomboo's Strange and Odd News, Zomboo reveals more of the important information not covered by the mainstream media. The seventh episode of season two of Nite Owl Theatre finds Fritz the Nite Owl joining in the intrigue in the movie Charade. 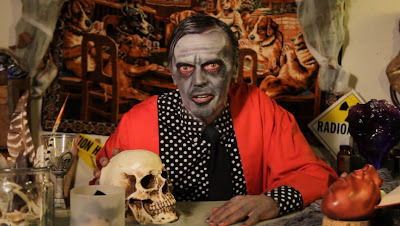 In episode four of Weird-O-Rama, Victor Von Psychotron visits a natural health store to talk with a doctor as he presents the mvoie Blood Thirst. 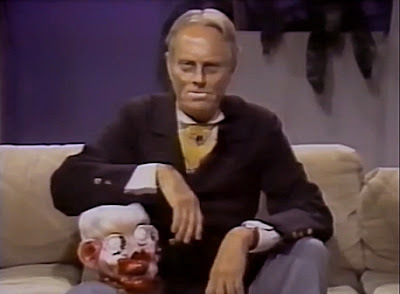 In a Halloween edition of The Joel Martin Show from the 1980's, Zacherley joined the host to discuss his career. 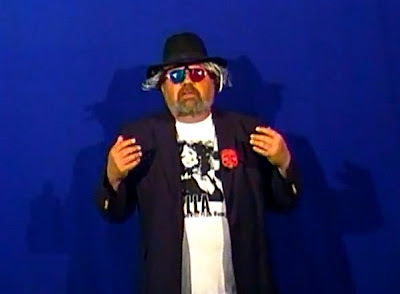 The September 2012 episodes of Bloodshot Theatre, has E. Spanto presenting the movie White Zombie. 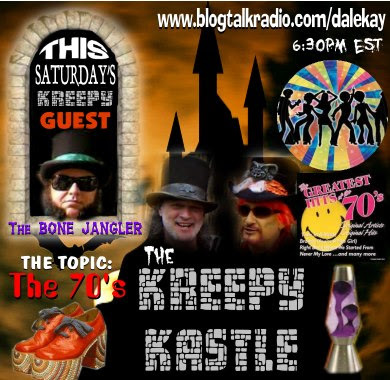 On the August 24, 2012 episode of The Kreepy Kastle radio show, The Bone Jangler joins Dale Kay and Halloween Jack as they discuss aliens of the 1970's. 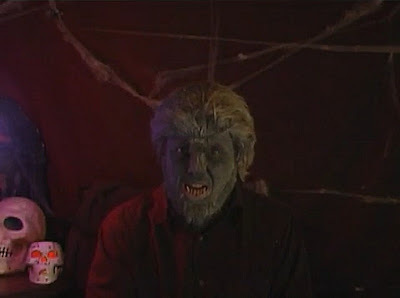 In an episode of Commander USA's Groovie Movies from 1988, Commander USA welcomes an old friend as he presents the movie Horror of the Werewolf. In an episode of The Greatest Show Unearthed, Barnabus Bailey lets Rita Mortiss do the introductions when they present the movie The Blood of Red Riding Hood. In an episode of Saturday Night Dead from 1986, Stella gets to try out for her favorite soap opera, A Sliver of Life. Screaming Horror 3D Theater - Arrrr, Bimbo! 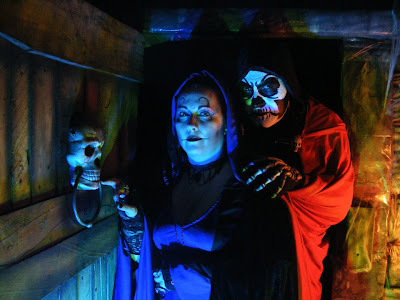 Beginning with the first episode of the sixth season of Screaming Horror Theater, the show will be recorded and shown in 3D and retitled Screaming Horror 3D Theater. 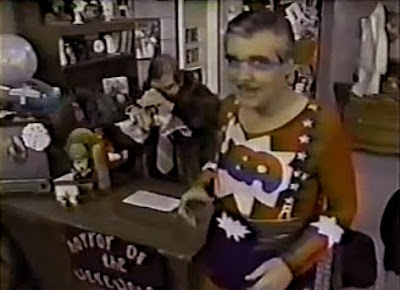 In the initial rebranded episode, entitled Arrrr, Bimbo!, Pirate Pete guest hosts as The Host goes to see a movie. 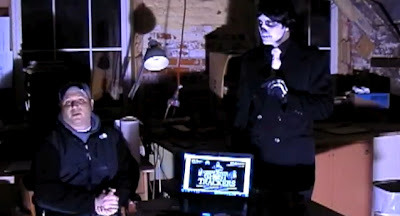 In an episode of Nightmare Cinema from September 2012, Wolfman presents the movie The Black Scorpion and the pilot episode of a Batgirl TV series. 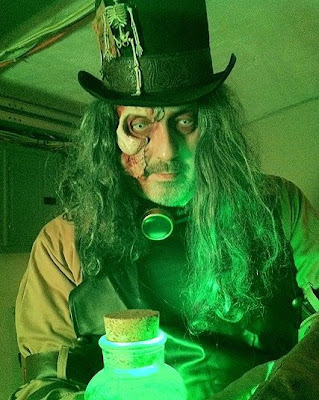 In episode 67 of Movie Madness Dr. Mel Praxis discusses and presents the movie Dead Men Walk. 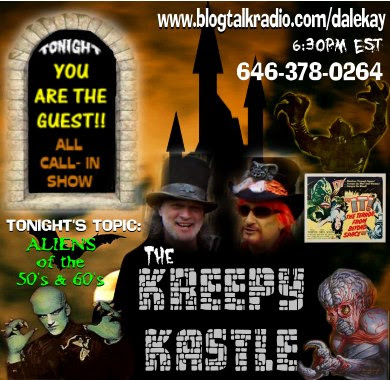 On the August 18, 2012 episode of The Kreepy Kastle radio show, Dale Kay and Halloween Jack discuss aliens movies of the 50's and 60's with Stella as a special guest. 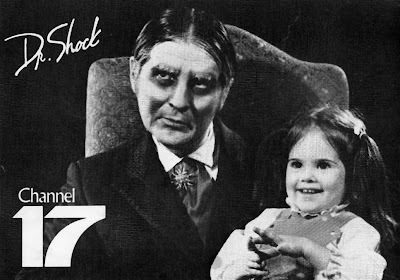 In the eleventh episode of the third season of The Dark Vault of Public Domain, Uncle Pete is deep in the vaults to find the movie Virus to present. 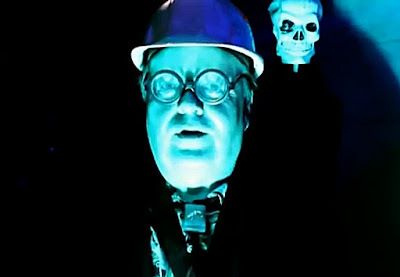 In episode three of Weird-O-Rama presents Victor Von Psychotron the movie Ghosts on the Loose and interviews the Great Lakes Ghost Trackers. 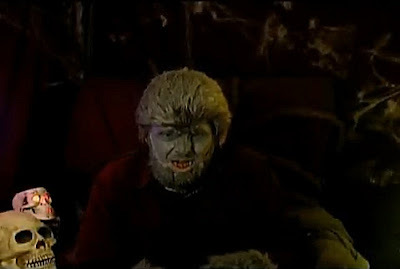 In an episode of The Schlocky Horror Picture Show, Nigel Honeybone provides his usual witty and insightful trivia about the movie Zontar the Thing from Venus. 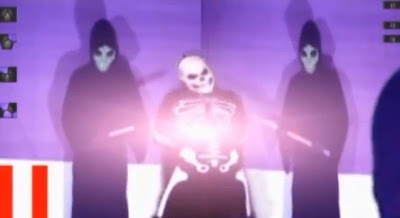 In episode 34 of The Angry Brothers Omaha Shock O Rama, Jack Angry, Inferna, and Syn have to deal with Brother James' unsuccessful weight loss attempt as they present the movie Galaxina. 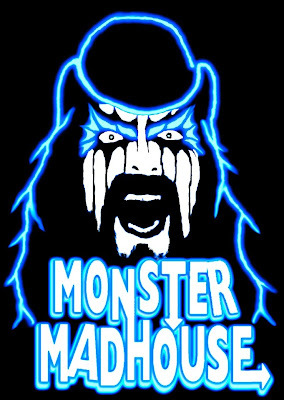 In an episode of Dr. Destruction's Crimson Theatre from June 2012, Dr. Destruction and Moliva Blosk talk about reality shows as they present the movie War of the Monsters. 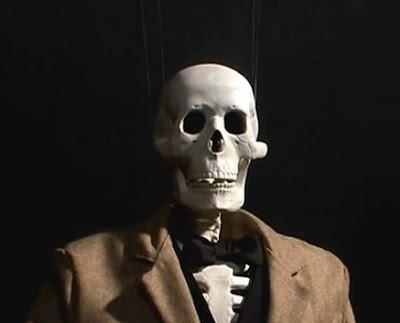 From the Darkness Theatre is a short film seeking funding to be completed that is about Uncle Seymour Cadavers, a popular horror host who receives a sad letter from one of his young fans. In the thirteenth episode of Riggor Mortiss Presents, Riggor Mortiss and Nyte Angel present the movie Attack Of The Giant Leeches. 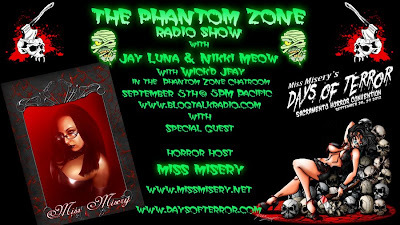 Miss Misery, from Miss Misery's Movie Massacre was recently a guest on The Phantom Zone Radio Show to discuss her show and the Miss Misery's Days of Terror convention. 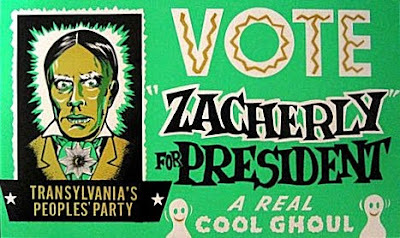 In 1960, Zacherley made a run for the presidency of the United States. Part of his campaign included a book, an official campaign kit, and even a special campaign edition of his Zacherley At Large show. 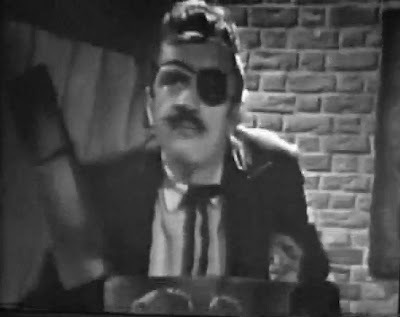 In the sixth episode of the second season of Nite Owl Theatre, Fritz the Nite Owl sends chills down the spines of his viewers as he presents the movie Horror Express. 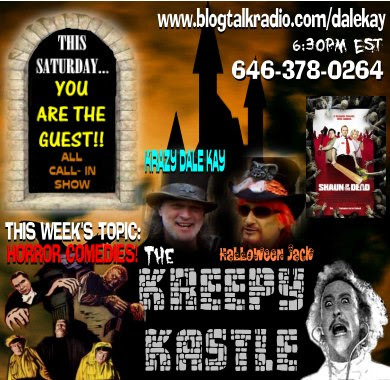 On the August 11, 2012 episode of The Kreepy Kastle radio show, Dale Kay and Halloween Jack discuss horror comedies with guests Dr. Mel Praxis and Halloween Jacqueline.